In May of 1985 I lived in a small, 1950's style apartment on Halton Court, a block away from the old Public Defender's Office and courthouse in Sarasota. I was 23 years old and already had a full caseload. 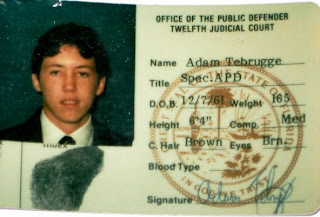 In the Summer of 1984 I had become a certified legal intern and tried my first three cases in front of juries. I was living with a dozen of my New College friends in a house on Palm Avenue across from Selby Gardens and driving my blue 1966 Mercedes to work at the PD's Office in Bradenton. The office was housed in what was then a decrepit Perinne Plaza, infested with rats the size of cats. I was supervised and trained by Charles Williams, Peter Belmont, Bob Turner, Janette Dunnigan and Peter Dubensky, and working with Steve Cooley, Bob Pell, Larry Eger and Jon Weifenbach. With such a caseload, there wasn't much time to study for the Bar Exam or take any review courses. I wasn't confident that I had passed the exam because they had the nerve to ask questions about areas of the law with which I was not familiar. Fortunately I was a Natural Born Test-Taker and was pretty confident that I had aced the multiple choice, multi-state portion of the exam. On the other hand, I had answered an essay question about corporations asked on the Florida portion of the exam by writing, "I am going to practice criminal law." So the issue was still in doubt when I left my apartment on May 22 to go handle a full day of non-jury trials before Sarasota County Court Judge Becky Titus. Now at that point, Judge Titus was my nemesis. She used to kick my tail on a daily basis, pointing out everything I was doing wrong and telling me I needed to improve. You know what, she was right. She was honestly interested not only in doing justice in her courtroom, but in helping to train a young lawyer along the way. Still, at the time, I didn't like it. I felt like my clients were suffering and that caused me to fight harder. She had been my Judge on December 28th and I had tried to soften her up by pointing out that it was my first day. She replied, "Its my first day too, let's get to work." She had just been elected Sarasota County Judge but had not yet married Elliott. During the morning of May 22, I think I had three or four non-jury trials and as I recall, I lost them all. I knew the Bar exam results were due to come out any day, and that I would be notified by United States Mail. We finally broke for lunch about 1:30 and I ran back to my apartment to see if the exam results had arrived. There was an envelope from the Florida Bar that I opened with a bit of trepidation. Inside was news that I had passed the exam and the background check, and included was the oath that needed attestation. I ran back to Court and Judge Titus was already on the bench, ready for the afternoon docket. She called the first case and I interrupted and requested permission to ask her a question. "What is it?" she said, somewhat crossly. "Are you a person authorized to administer oaths in the State of Florida," I asked? "Yes, of course," she replied. "Then, Your Honor, would you swear me in to the Bar before we go any further?" She seemed to soften just a bit, administered the oath right then and there, and we got back to work. I don't think I did any better with my cases in the afternoon session, but it was my first official day as an attorney. Judge Becky Titus went on to the Circuit Court and was one of the finest judges in our areas's history. And as for me . . .
My 23 years at the Public Defender's Office were mostly good. I felt like I was playing an important role in the criminal justice system. One big reason I went to law school was to fight the death penalty. I handled my first capital case in 1990 and my final one in 2007. While I was able to keep a lot of people off death row, I also failed in half a dozen cases. I would tell myself that at least I was the one trying to prevent it from happening. I worked with some terrific people at the PD's office, really too numerous to mention. 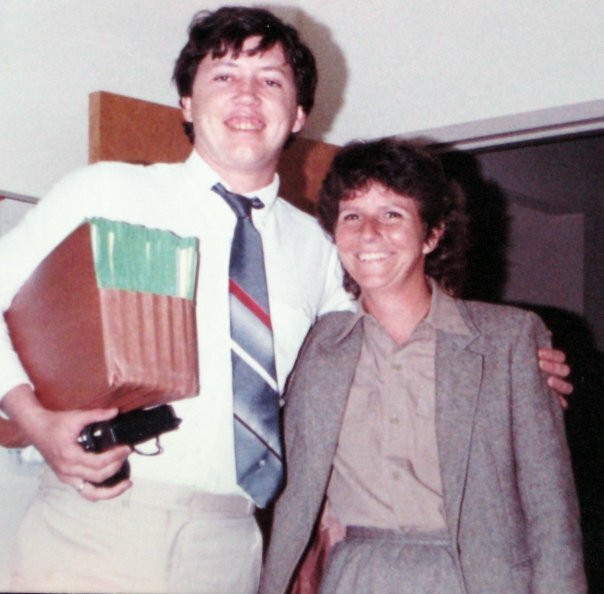 One person who kept me on track for many years was my legal assistant, Linda Wise. Nobody knew more about the courts then Linda, and she could solve a lot of problems without my input. One other person I should mention is Jim Slater. Jim was the head of our Bradenton office and a top notch attorney. When he died, eight years ago, he left a leadership void that was never filled. As you know, the biggest disappointment in my professional life was losing the Public Defender election in 2008. I had big plans for the office to take us into the 21st century. But the only thing to do after you fall is to pick yourself up, brush yourself off and start all over again. Regina and I took a few months after the election to ride bikes, read books and reconnect. 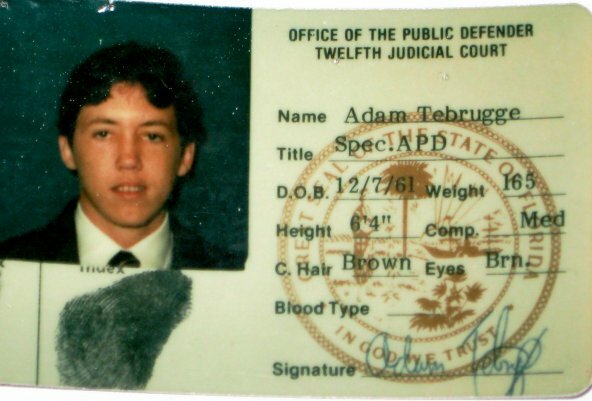 By 2009 I was ready to get back to work and opened Tebrugge Legal. I will be forever grateful first to Liane McCurry and then Mark Lipinski, each of whom gave me crucial support as I transitioned into private practice. Mark remains my landlord and I am delighted to be occupying the second floor of his building at 520 12th St. West in Bradenton. These past few years have given me an even greater opportunity for community involvement. I have tried to tackle the issue of homelessness, and I have been proud to be an adjunct professor at Stetson College of Law where I train students in the mysteries of the death penalty. It is sometimes hard to practice law. I no longer feel like I am a part of the criminal justice system or that I am making a big policy difference or even protecting the Constitution. My biggest disappointment is with the judiciary. Too many judges demand respect and stress the role of the courts, but have little interest in upholding our country's legal traditions. I must battle cynicism and apathy on a daily basis, and I usually feel like I am losing. Really the only reason I keep it up is for the clients and their families. Somehow I am still able to help individual people out of their predicament and that is what keeps me going. If I could impart one lesson to everyone in the system it would be not to lose sight of the humanity of every person caught up in its web. So 28 years later I felt like reflecting and moving forward. The experiences I have had make me a better lawyer than I was as a youthful idealist, as long as I feel some of the passion that once burned so bright. I see the new lawyers coming out and hope that they will at least try to do the right thing, whatever that may be that day. I have been privileged to receive a number of awards, but perhaps the most meaningful was the Jim Slater Award for Professionalism in the Practice of Criminal Law, simply because of my respect for Jim. This year the award went to my friend Rebecca Wilson, and that makes me think things can't be too bad. 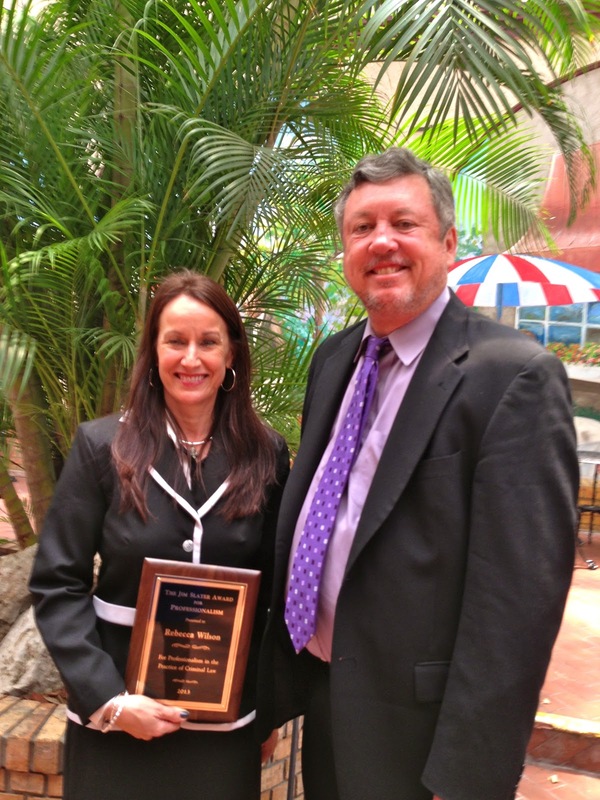 She was nice enough to have a picture taken with me last week after she received her recognition. And I hope to keep doing my best possible job in representing the citizens of the State of Florida when they are caught up in our criminal justice system. I thank all of my friends, clients, jurors and fellow citizens for all of the support you have given me over the course of my career.